More than three decades after the release of The Karate Kid, a proper TV series is happening with the stars of the original 80s classic. Ralph Macchio and William Zabka are both set to star as Daniel LaRusso and Johnny Lawrence respectively in a Karate Kid TV series on YouTube Red, which has already been given a 10-episode order, titled Cobra Kai. The most surprising part? The show is being described as a half-hour comedy. The news comes courtesy of The Hollywood Reporter who reveal that there was a very competitive situation going on for The Karate Kid comedy series, with offers coming in from Netflix, Amazon, Hulu and AMC before finally landing on YouTube Red. The series is going to embrace the original movies and will follow the same timeline, but with Daniel and Johnny both operating rival gyms. Here's how THR describes the series. "The series, set to bow in 2018, is set 30 years after the events of the 1984 All Valley Karate Tournament and revolves around a down and out Johnny who, seeking redemption, reopens the infamous Cobra Kai dojo. It reignites his rivalry with a now-successful Daniel, who has been struggling to maintain balance in his life without the guidance of his mentor, Mr. Miyagi (the late Pat Morita). The half-hour comedy follows the duo addressing demons from their past and present frustrations, through (what else?) karate." Cobra Kai will be written by Josh Heald (Hot Tub Time Machine) as well as duo Jon Hurwitz and Hayden Schlossberg (Harold and Kumar), who are also set to executive produce the series alongside Ralph Macchio and William Zabka. Hurwitz and Schlossberg are set to direct much of the series themselves. Will Smith's company Overlook Entertainment will executive produce the series for YouTube Red. Here's what Jon Hurwitz and Hayden Schlossberg had to say about the series in a joint statement. "Like everyone who grew up in the 1980s, the three of us are enormous fans of The Karate Kid. Cobra Kai​ will be a true continuation of the original films, packed with comedy, heart and thrilling fight scenes. We can't wait to reignite the LaRusso-Lawrence rivalry, and we're thankful to our partners at YouTube Red, Sony Pictures Television and Overbrook for their shared enthusiasm in making our dream project a reality." The Karate Kid is considered one of the seminal movies of the 1980s and has remained popular in the years since its release. There were two proper sequels with The Karate Kid Part II and The Karate Kid Part III, as well as a sequel that didn't feature Ralph Macchio or William Zabka, The Next Karate Kid, which starred Hilary Swank in the lead role. There was also a reboot in 2010 with Jaden Smith and Jackie Chan. 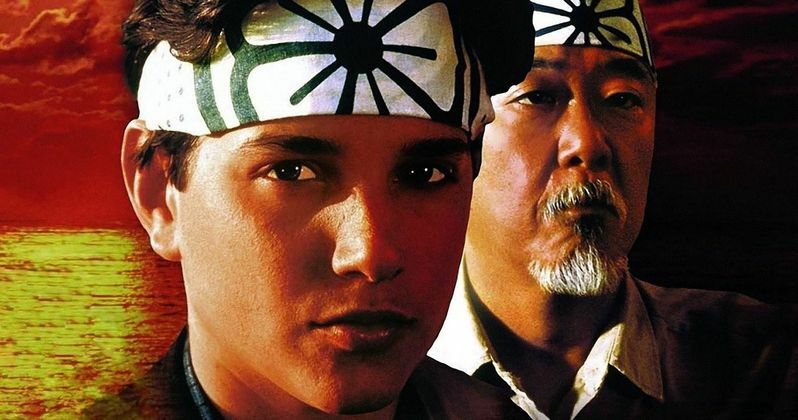 All of The Karate Kid movies have made a grand total of $619 million worldwide. YouTube Red had not set a specific premiere date for Cobra Kai yet, but it is set to debut on their streaming service next year. We will be sure to keep you up to date as more details on the series are made available.